For the golfers among you, the Algarve offers some of the best golf courses in Europe! Below you will find a small description on some of the Golf courses that are close to our apartment in Armação de Péra. Situated close to the sea, Salgados and its lakes pose a real challenge to the technical skills of a golfer. This proximity to the sea and the variety of lakes make this a very interesting golfing test, different to the other courses in the Algarve. The course, a links with many water hazards, is not very long, yet you will need all your short-iron skills to reach the greens. Driving accuracy is also essential for achieving good scores, making the course a pleasant experience, especially for players with reasonable technical skills. 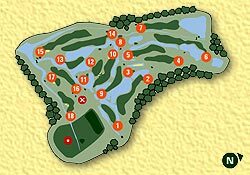 Besides this, the eighteen holes are well balanced, as each half of the course has two par 5's of around 500m and two par 3's of over 170m. The course was opened in 1995 and is a par 72 (5,640m); Facilities include: Putting Green, Trolleys, Club Rental, Pro-Shop, Buggies, Restaurant, Bar, Hotel and Beach. Situated near Carvoeiro in an old olive grove, Vale da Pinta is a championship course which is, nevertheless, adaptable to all playing levels. 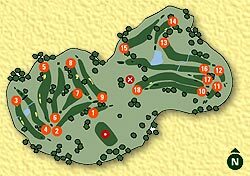 Designed by Ronald Fream, who, true to North American golfing concepts, created wide, deep greens protected by 59 similarly sized bunkers. 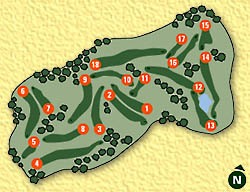 The course difficulty is flexible, as each hole has five sets of tees for different handicaps. Since September 1996 the development (which includes the Quinta do Gramacho course) has also housed the David Leadbetter Golf Academy, the fifth bearing the legendary British golf guru's name in Europe. The course was opened in 1992 and is a par 71 (5,237m). Facilities include: Driving Range, Putting Green, Trolleys, Club Rental, Pro-Shop, Buggies, Esplanade, Pitching area with Bunker, Golf Academy and Snack Bar. Alto Golf is situated near the picturesque village of Alvor, its former beauty enhanced by the fabulous white sandy beaches, crystal blue sea and striking cliffs of the coast. It reflects Sir Henry Cotton's philosophy that a golf course should constitute a good test not only for low handicap players, but also provide an agreeable game for less blessed players. After his death, the project was continued by Peter Dobereiner. The course runs through two valleys with winding fairways and undulating greens. On the first nine, players can enjoy an excellent view over Lagos bay. The last nine unfold along gentle slopes and include what is said to be one of the longest holes in Europe: the 16th, a 604m par 5. Any player making a birdie here will receive a certificate and their name will be inscribed on the club's roll of honour. The course was opened in 1991 and is a par 70 (5,532m). Facilities include: Driving Range, Putting Green, Trolleys, Club Rental, Pro-Shop, Buggies, Bar, Restaurant, Pitching area with Bunker and Children's Play Area. 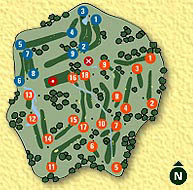 With 3 nine holes courses to choose from, Gramacho has a complete course layout, thanks to its double tees and greens. The natural vegetation blends perfectly with a number of lakes and gently sloping fairways which wind through almond groves and olive and fig trees. Designed by the North American Ronald Fream, and adjacent to the Vale da Pinta course (both part of Carvoeiro Golfe, close to the fishing village of Carvoeiro), it unfurls through rolling countryside, the vegetation blending perfectly with the man-made lakes and bunkers. The course was opened in 1991 and is a par 72 (5,532m). Facilities include: Driving Range, Putting Green, Trolleys, Club Rental, Pro-Shop, Buggies, Pitching area with Bunker, Restaurant, Golf Academy and Snack Bar. The Penina Championship Course is the most brilliant of Sir Henry Cotton's designs. The triple winner of the British open, later a course designer, was one of the first to recognise the Algarve's enormous potential as a golfing paradise. The quality and success of the Penina course encourages the construction of many other courses in the Algarve. The Championship Course opened in 1966, and although totally rebuilt in 1994/95, it still maintains its original features. It is a fairly flat, wooden course, with countless bunkers, almost four hundred thousand trees, several lakes, wide greens and a vast tee area, making the course a true championship test. 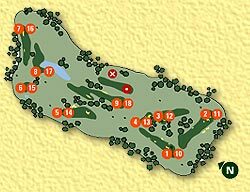 Penina also boasts two nine-hole courses, also designed by Sir Henry Cotton: the Resort Course, a charming par 35 (2,987m); and the Academy Course, a short par 30 (1,851m). Facilities include: Driving Range, 3 Putting Greens, Trolleys, Club Rental, Pro-Shop, Swimming Pool, Solarium, Tennis, Private Beach, Buggies, Pitching area with Bunker, Restaurant, Golf Academy and much more. Please note soft spikes only on the Championship course.